This article was written in 1978-79 and submitted to Will Murray for possible inclusion in DUENDE #3. Will was initially enthusiastic about it, but the tonality was just not right for DUENDE. We kicked it back and forth for editing and rewrite a time or two. Meanwhile, Will moved on to bigger projects, and DUENDE #3 never materialized. But in the process, he had put me in touch with Dafydd Neal Dyar who took an amateurish floor plan I had sketched to illustrate the piece and, applying his drafting skills, transformed it into the intriguing schematic shown below. 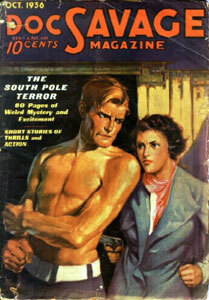 This illustration eventually appeared as a stand-alone in Millenium Publications' Doc Savage: Manual of Bronze (August 1992). Reunited with the floor plan here for the first time is the complete text of the article it was originally intended to accompany, but which ultimately was never published. On the lowermost floor of a skyscraper many blocks distant, the crimson fingered man focused his glasses. He started counting stories upward. The building was one of the tallest in New York. A gleaming spike of steel and brick, it rammed upward nearly a hundred stories. The broad, polished top of a massive and exquisitely inlaid table stood directly before the window. Beyond it was the bronze figure! Doc's movements were rhythmic as he swung over and perched on a corner of the big, inlaid table before the window. His eyes roved slowly over the beautifully furnished office. There was another office adjoining, larger, which contained a library of technical books that was priceless because of its completeness. Adjoining that was the vast laboratory room, replete with apparatus for chemical and electrical experiments. 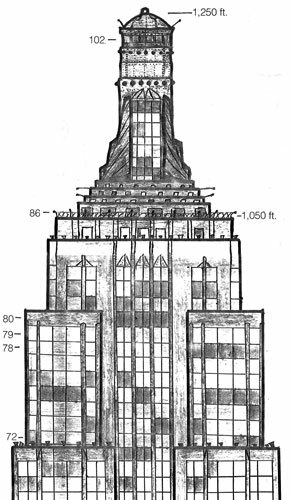 The image of the 86th floor headquarters evolved and expanded over the course of the 181 novel series. 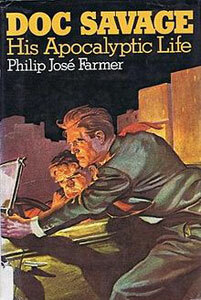 As Philip Jose Farmer noted in Doc Savage, His Apocalyptic Life, Dent obviously means the Empire State Building when he describes the skyscraper housing it. 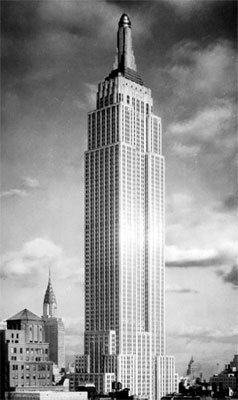 The ESB opened May 1, 1931. Towering over Manhattan with its much publicized 86th Floor Observation Deck, it captivated the depression era public imagination. The building has consistently generated more money in observation deck ticket sales than for office space rentals. Its race to claim “tallest in the world” honors over the nearby Chrysler Building -- under construction at the same time and opened in May 1930 -- brought both projects plenty of press coverage. It is my theory that early on, Lester Dent explored the ESB to some degree, loosely modeling his fictional HQ on an existing layout of some floor (or floors) of the building. Similarities of HQ details in the series to actual features of the ESB are not coincidence. There is a single reference to the HQ in Dent's notebook, written before The Man of Bronze. It states that only Doc's living quarters exist on the 86th floor, and the laboratory and library are on the 13th floor, unknown to the public, as 13 is superstitiously omitted in the numbering. But in this instance, the stealth floor actually exists -- a hidden lair, much like The Shadow’s sanctum. It is accessible by an elevator which also goes to the 86th floor. 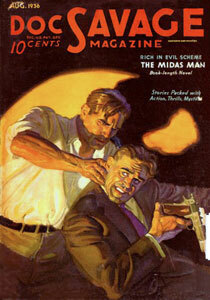 This arrangement is never reflected in any of the pulp stories. 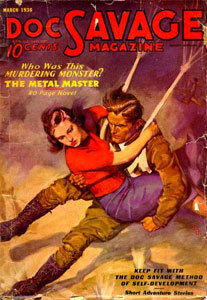 Street & Smith executive Henry Ralston wrote the original story outline for The Man of Bronze. Ralston has the HQ existing high in a skyscraper, on the 86th floor, and the office (Dent would later call this the reception room) as having spacious windows on two sides. There’s no indication of a split set-up, but rather the entire HQ existing on the 86th floor. Dent may have recognized the efficiency of Ralston's plan and “86ed” the HQ notion that appears in his notebook. Sometime thereafter, I believe he stopped by the ESB to better familiarize himself with the locale and made observations of the upper floors. 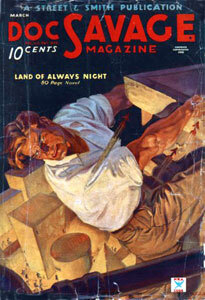 From this, his potent imagination shaped visions of the 86th Floor HQ, and it came to life for him. Why create something from scratch when there’s a real world model available to shape it on? Dent’s notes contain no other details about the HQ beyond his initial aborted description. This hints to me that he had the features of the HQ fixed in his memory almost photographically, the way we recall places actually visited. His concept of the HQ can be reconstructed only via references to it in the Doc Savage stories -- interpreted in light of the actual layout of a suitable upper floor of the ESB, I would contend. Someone will doubtless note that Philip Farmer undertook a thorough analysis of HQ references in Apocalyptic Life and presented a highly specific diagram of its layout. 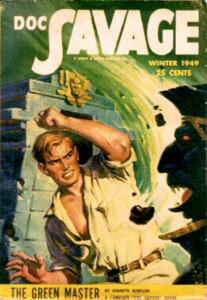 Because Farmer’s book has been so widely read by followers of the series and regarded by some as the definitive work on Doc and company, we should digress a bit and comment further about Doc Savage, His Apocalyptic Life. First off, consider the fanciful premise of the book. It portrays fictional characters and events as though they had actually existed, mixing in factual and pseudo-factual information to lend credence to the effect. 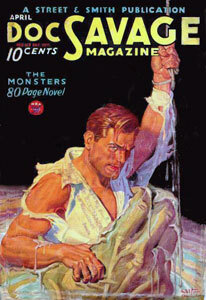 Lester Dent (and the other Kenneth Robesons) acted as raconteur for the "real" Doc Savage, writing dramatically enhanced memoirs of his adventurous life. It's clever, and can make for a fun read, but with fact and fiction so muddled together, the book must be regarded as less a history of the series than it is a fantasy about the series. The book contains considerable misinformation. By tracking down Farmer's outside sources (often easy due to near-copied paragraphs) I detected some significant, elementary research errors. Often his information is not double-checked against other available data on the same subject. In one instance where he cited a second source, I found he had failed to take into account that one article used, as its source, the other article and propagated the same errors. His material on the ESB elevators and some of his statistics regarding both the ESB and the Chrysler Building are largely inaccurate. Then there are his compilations of details from the Doc series itself. 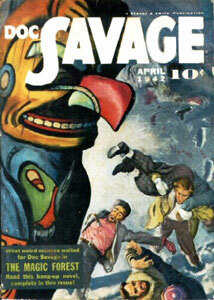 In his chapter on Patricia Savage, he enumerates her appearances, novel by novel. 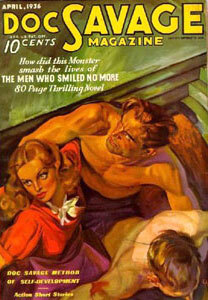 He starts out contradicting himself by citing The Men Who Smiled No More as her seventh appearance and The Black Spot as her eighth (p. 139, Doubleday edition), then (p. 145) calling The Men Who Smiled No More her eighth episode (correctly -- she even makes the Walter Baumhofer cover art). He throws his count off by missing her not insignificant role in Land of Long Juju. By the time he gets to calling The Men Vanished her 20th supersaga ( p. 152), his count is off by two -- he has overlooked her role in World’s Fair Goblin. As a result, Pat actually makes her appearance in 39 stories rather than just the 37 that Farmer tallies. In his chapter on Habeas Corpus and Chemistry, Farmer states that, although Monk Mayfair's pet is mentioned as being in New York in The Pharoah's Ghost (June 1944), Habeas Corpus makes his last appearance in the series in The Devil's Black Rock (December 1942). Yet Habeas shows up again in a sunken mud pool in the middle of Monk's Wall Street apartment in Chapter 2 of Rock Sinister (May 1945). Stories involving dirigibles are dealt with in his chapter on The Hidalgo Trading Company and its craft. 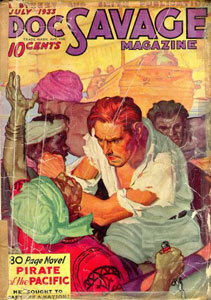 Once again, as with his Pat Savage count, he mistakenly totals only nine airship stories. There were twelve. Farmer overlooked Dust of Death, The Terror in the Navy and the very last airship story, The Headless Men. Farmer’s analysis of factual material from some of the stories is flawed because he did not have information regarding the order in which the stories were actually written, vice the order in which they were published. This accounts for his inability (p. 80, Doubleday edition) to accurately explain why Doc is renting the 85th floor in The Metal Master (March 1936), isn't renting it in The Midas Man (August 1936), but is renting it again by The Green Eagle (July 1941). He calls it a contradiction. What he doesn’t know is that The Midas Man was written more than a month before The Metal Master, though it was published five months after it. There are other such errors. Though I feel Philip Farmer is a delightful crafter of science fiction and fantasy lore, research may not be his strength. In the process of double-checking the references he makes to the Doc series in Apocalyptic Life -- and especially to the HQ floor -- I filled most of a college notebook with comments and corrections on his text. The diagram Farmer offers of the HQ floor is not a satisfactory reflection of the details concerning it in the Doc novels. The Empire State Building is 102 stories tall. 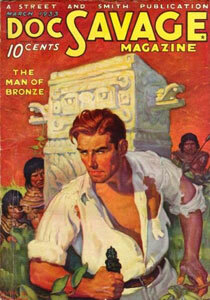 I think Lester Dent used one of these floors as a model for his Doc Savage HQ. But which floor (or floors) might he likely have investigated to find one that felt right? He would not likely have chosen one of the lower floors even though they are larger in size. The view of the city and surrounding area is too restricted. especially below the 30th or 40th stories; a number of adjacent structures are (and were) high enough to impede visibility considerably. And the Doc stories too often describe situations which necessitate the HQ being on one of the higher floors. In The King Maker (co-authored with Harold Davis -- viability of descriptions in ghosted works will be discussed later), Chapter 3, Doc sees the explosion of Baron Mendl's yacht in the Atlantic Ocean south of New York, over 15 mi1es from the HQ. In The Terror in the Navy, Chapter 3, Fuzzy sees a sign lofted by balloon from a barge on the Hudson River. Crooks have been spying on Doc by telescope from this sign. Chapter 8 of Poison Island finds Renny and Johnny viewing the signs and lights of the theater district more than a dozen blocks up Broadway. In Strange Fish, Doc sees Broadway and Central Park whi1e looking north from an HQ window. An upper floor location would definitely seem in order. But which ones would work? The 102nd can be eliminated. It is the upper observation platform and is capped by a metal dome a bit larger than a regulation-sized baseball pitcher's mound. The 101st through 87th won’t work either. They are all fairly small as well, housing primarily elevator machinery, electrical equipment and water tanks. As Philip Farmer noted in his book, the 86th floor has always been the observatory. It could not have served as Dent’s model floor, despite myriad references in the Doc novels to the HQ occupying the 86th floor. That was simply the floor the public knew best as being at the top of the ESB. And that’s where Dent and the magazine’s other creators wanted Doc operating from. I think it’s curious that in both Dust of Death (also co-authored with Harold Davis) and The Terrible Stork we are told there are other facilities above Doc's floor, including an observation deck with“a railed platform,” same as the ESB’s actual 86th floor. Chapter 4 of Dust of Death has crooks descending from this observation deck by stairway to a floor somewhere below that is still above the HQ! From there, they cut cables to Doc's private elevator. We are not told how many stories they came down by stairway (it is described as “a small set of steps”) or how many stories above the HQ the floor containing the machinery for the speed lift is located. 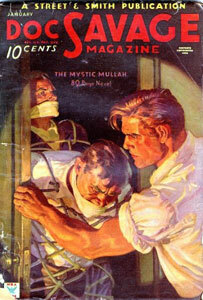 A couple pages later, the crooks are said to be “high above” looking down the shaft from the point where they cut the cables into Doc’s elevator cage through its grilled top. Unlike the Dust of Death crooks, Dent in reality might have had some trouble getting off an elevator or out a stairway exit on floors 81-85. There is service area and machinery on these floors as well, so the public is kept off them. It would have been much easier for Dent to observe floors 80 or below. The area of the 86th floor observatory is not particularly large, its actual dimensions being only about 75 ft. x 130 ft. Much too small for the HQ described by Dent and the other Doc authors. The 85th floor down to the 81st are only slightly larger in size. In The Green Master, the dimensions of the HQ reception room are given as 20 ft. x 40 ft. In The Devil's Black Rock, the library is said to be larger than the reception room, and the laboratory is said to occupy over 2/3 of the floor. If we estimate the library was 2.5 times the size of the reception room, the two rooms together might cover about 2,800 s.f. Include another 2,000 s.f. of corridor and elevator bank space for a total of 4,800 s.f. If the lab covered 2/3 of the floor, it would be at least twice that area, about 9,600 s.f. That all totals perhaps 14,400 square feet. That’s very close to the 14,600 s.f. areas of floors 80 down to 72. To me it seems most likely it was one of these which Dent may have used as his model for the Savage HQ. There’s a peculiar statement in The Green Master that the regular elevators did not access the HQ floor, and that Doc had to take a stairway to the floor below to catch the elevator. Yet all too many of the novels have people rocketing non-stop express from the lower floors directly to the HQ with no mention of stairs or a cage change. In reality, there are no cages in the ESB which travel directly from the first floor to the 86th floor. Weight of cables and resulting stress has yielded elevators designed to travel only to the 80th floor direct. Getting to the 8lst through 102nd stories requires changing to another cage at the 79th or 80th floor. To continue our search for Dent’s HQ prototype, I tend to rule out both the 79th and 80th floors, because they serve as junction points for tourists changing cages enroute to and from the observation decks on the 86th and 102nd floor. On a typical day with good visibility, there could be a couple hundred camera-carrying tourists constantly lined up in the corridors of the 79th and 80th floors, waiting on cages to take them up or down. The 80th even has an extended southwest corridor, reaching clear to the outer west wall of the building, to better accommodate these long lines. It’s worth noting the terminus of that corridor is windowless -- in fact, the 80th has very few windows, compared to the floors below it, another reason to reject it as the HQ model. Chapter 10 of The Awful Egg states that the outer walls of all three HQ rooms are composed almost entirely of glass. I think to avoid all the sight-seers, Dent might have gone down a floor or two. Only because it is the loftiest floor left, I personally favor the 78th as the model floor, although general layouts of floors 72 to 79 are all similar. I have visited the 78th several times within the past year, making in-depth observations and sketching its features as they now exist. An interesting aside, I learned that extensive repairs were necessary in that area of the building when a B-25 Mitchell bomber strayed off course in heavy fog and crashed into the north face of the 78th and 79th floors in July of 1945. 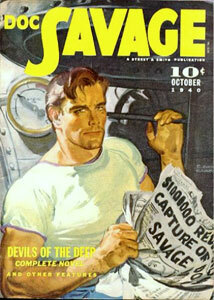 What a great plot point that would have made in a Doc Savage story, I’ve always thought! Scanning through all 181 pulp stories and compiling every HQ reference, I combined these with my observations of the actual layout of the 78th floor and constructed my own diagram of the HQ as Lester Dent may have imagined it. I started with the reception room which was said to be 20 ft. x 40 ft., in the northwest corner of the building and having windows on both the north and west walls. Given the actual physical layout of the 78th floor, I sketched its boundaries. It turns out measuring closer to 26 ft. x 46ft. Next I moved to the laboratory, which I knew should be about 2/3 of the total office area. Once again considering existing interior support walls, I sketched the limits of the lab. 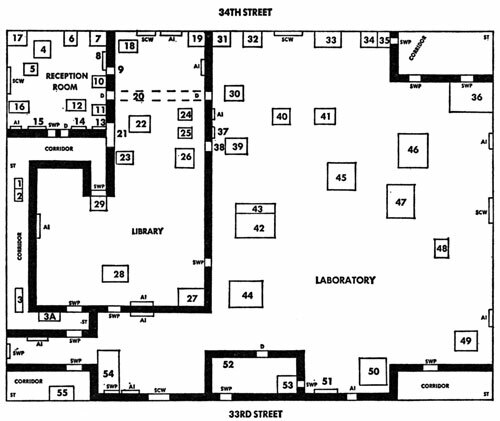 The remaining area would have been occupied by Doc's library. Quest of Qui, Chapter 4, The Yellow Cloud, Chapter 4, and The Stone Man, Chapter 4, all present the laboratory as having three walls in windows. Chapter 10 of The Midas Man goes on to tell that the fourth wall looks solid. Note that this solid wall is the north wall, as reflected on my diagram, and not the south wall as Farmer states. 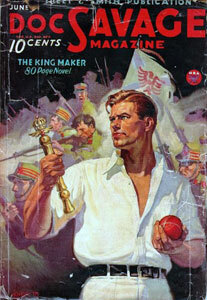 As it happens, there are some descriptive references in the pulps which do not pan out practically. For example, it is nearly impossible that the laboratory extended to the north wall of the building as occasionally indicated. This would have reduced the area of the library far too much. Another problem arises in Chapter 1 of The Mystic Mullah which mentions an exterior window located in the corridor near Doc's elevator. As can be seen in the diagram, the corridors of the 78th are far removed from the windows. We might also deal with Farmer's "specially constructed windows," which to me remain a total enigma. While trying to explain his diagram in his chapter on the HQ, he claims that in The Monsters Dent described the lab as having windows on all four sides, the fourth side being the south wall which supposedly held these "specially constructed windows." Chapters 4, 5, and 6 contain the only HQ description in the story -- but no mention of windows. Fact is, there is no such reference in The Monsters at all. The special one-way windows described in Chapter 5 of The Derrick Devil, which allowed people to look out but made it difficult for anyone outside to see in, perhaps qualify, as apparantly all of the windows in the HQ were of this special glass. The "especially constructed, huge windows" in Chapter 13 of The Flying Goblin (a William Bogart story) seem to form a single portal, judging by the view afforded, somewhere in the east or south wall -- and this is the only such opening described. But Farmer has "specially constructed windows" strewn all over the HQ, without explanation of what is so special about them. A word of clarification is needed regarding my placement of the wall between the lab and the library. There are a couple references in the novels to lab windows facing north (Strange Fish, Chapter 4, Doc sees Central Park through a lab window). Drawn that way, not only would the library area be reduced ridiculously as already noted, but we would be back to the three-sides-in-windows problem, trying to rationalize the windows out of one of the exterior lab walls. Too, my diagram shows the library with two walls of windows rather than one as hinted at in the pulps (Terror in the Navy, Chapter 3). At some point, we have to concede that Dent made small descriptive oversights. In Chapter 2 of The Awful Egg, Doc moves to what is presumably one of the reception room windows, before which is spread "a remarkable panorama of Manhattan buildings, the bay and, far in the distance, the sea." From various descriptions we know that the reception room windows faced north and west, which would provide a view of Yonkers, the Palisades and, on a clear day,the Catskill Mountains -- but not the bay and ocean. This glitch in description might be an indication the story was done, at least in part, by a ghost writer unfamiliar with the HQ environment. Or else Dent himself, perhaps laying down story quickly, just made a mistake. The question of doors opening onto the main corridors presents itself. There are of course several on the actual 78th floor, each of the buinesses located there having at least one. It is my suspicion that Dent imagined several doors opening onto the main corridors of the HQ, though most were probably not used. In Chapter 4 of The Freckled Shark, Rhoda Haven takes an elevator to the HQ floor and finds herself “standing in a corridor which had one door, an unobtrusive, bronze-colored panel lettered simply: CLARK SAVAGE, Jr.” It is difficult to say from this reference if that means there is only one door or just one in a particular corridor. The matter seems pretty clear in Chapter 1 of The Man Who Shook the Earth, though. Velvet arrives on the HQ floor and “waded the carpet down the corridor. His gaze roved over door numbers. He reached the one he desired.” Obviously more than one door. In Chapter 4 of The Evil Gnome, Lion Ellison “stepped out into a modestly decorated hallway, the walls of which were completely blank except for one door, a bronze-colored panel.” However, there is “another small door at the side of the elevator,” and through this comes Ham Brooks. The matter turns up again in Chapter 8 of The Terrible Stork. Speaking of the HQ floor: “the hall, for instance, was like the halls on the other floors, except that only one door had a name on it." That makes it pretty clear -- more than just the reception room door opening onto the main corridors. Chapter 6 of Pirate of the Pacific makes reference to a thug boring a hole through the wall of a vacant suite adjoining Doc's reception room in order to steal a message Doc had left for his men. Farmer gives an absurd explanation of this in Apocalyptic Life. Is it possible that Dent imagined a vacant suite, with a door opening out onto the main corridor, adjoining Doc's reception room in the early days of the HQ? By the time of Mystery on the Snow, Doc would seem to have annexed this suite as an extension of his laboratory. With this space added, and contrary to the way Farmer diagrams the HQ in Apocalyptic Life, the layout was actually a big circuit, and the reception room, as well as adjoining the library, also adjoined the laboratory on one wall. This is confirmed in Chapter 4 of Death in Silver which contains a statement to the effect that the library and lab are both adjacent to the reception room. There seems to have been a door installed, connecting the reception room with this wing of the lab, though this doorway is used infrequently and at times seems to be either removed or blocked off. The route through the library is the most common one into the lab. But there are incidents demonstrating the existance of this other doorway, directly connecting reception room and laboratory. In The Mystery on the Snow, Chapter 5. Johnny is alone in the reception room when he hears a voice from the laboratory. In Dent's words:“Johnny ambled to the laboratory door and looked in,” suggesting that the two rooms were connected by a door. Hint of the passage comes again in The Mystic Mullah, Chapter 8. Doc and his men enter “'his office” (the reception room) and “stepped into the great laboratory.” In Secret in the Sky, Chapter 1, Doc goes from the reception room into “the next room, which was a scientific laboratory.” In The Invisible Box Murders, Chapter 2, Jen Bridges in the reception room looks around “at the library and laboratory which showed through open doors." The Man Who Shook the Earth, Chapter 2, finds Monk in the reception room checking the “doors into the inner rooms,” obviously meaning the one into the library and the other into the lab. The most conclusive evidence of the door is found in The South Pole Terror (co-authored by Davis), Chapter 7. Long Tom is captive of intruders in the corridor outside the reception room door. Doc is inside the reception room, facing the corridor through the open door and lip reads Long Tom's mouthed words: “Behind you ... more men hidden in the laboratory!” Men “coming out of the library and laboratory” then close on Doc in the reception room. This reference is very specific. The reception room was connected to both the library and the lab by separate doorways, and the door to the lab would be behind a man standing where he could look out the reception room’s main entry door and see down the corridor. In The Wee Ones, Chapter 3, Doc is sleeping on “a folded bed arrangement in a cubicle off the laboratory.” He wants to get some uninterrupted rest, so “by closing the reception room and library doors, he wouldn’t hear knocking at the hall door.” In addition to another doorway from the reception room, this reference seems to suggest Doc had some kind of make-shift living quarters situated between the reception room and lab. The door is apparently camouflaged around the time of Poison Island. In Chapter 8, Renny and Johnny are detained by thugs in the reception room, when they hear thumping noises “as if someone was trying to get a door open. The noise came from the laboratory. ‘Is there a secret back door to this place, or something?’” one of the crooks asks. Renny lies and says no. The crook calls his bluff, and Renny is about to disclose the door when the lights go out, and Doc enters the ensuing fray from the lab via the secret door. The doorway is once again in evidence in The Terrible Stork, Chapter 4. From the reception room, Doc discusses matters with Ham who is taking a shower in a corner of the laboratory. Ham strolls into the reception room a moment later, naked, toweling himself and shortly returns to the laboratory. He must have used a door connecting the two rooms directly, as it is doubtful that he would have traipsed naked the entire distance to come the other route through the library. Nor could Doc and Ham have carried on a normal-voiced conversation over that distance. Our door is the only answer, and we might further conclude from this episode that the shower stall was in the northwest end of the laboratory. A shower located there would make sense as a feature of the make-shift living quarters mentioned above. The positioning of the “flea run” on the diagram is only a suggested location, as there is no information in the pulp stories specific enough to place it exactly. Still, as it is a fixed feature, like the elevators, it deserves some attention. Because of the bulk of the tube in which it operates, I rationalized it might be located centrally in the layout, adjacent to the elevator shafts, as its shaft, too, would run almost the full height of the building. Being near the elevators might also help mask the sound of it operating and better preserve secrecy of its existence. Farmer’s arbitrary placement of it, isolated against the south wall, seems far less feasible. Most helpful in determining a location for the flea run is The Midas Man, Chapter 8, where it is described as having its laboratory terminal in the wall behind a hidden panel. Dent deemed it necessary to note that this panel is not the same concealed panel leading from the lab to the outside corridor through which Ham Brooks passes a couple pages earlier, hinting that the two are in proximity of each other. The panel Ham uses would probably be the door at the west end of the elevator bank corridor. The flea run would be very near there. I have made few attempts at indicating the locations of furniture and the like, compared to what Philip Farmer did in his Apocalyptic Life HQ diagram. After rechecking the references to all those items he set in some exact spot in the HQ, I found few of them were ever described precisely enough to place them out of anything other than a wild guess. 1.) The HQ local is not utilized, eliminating it as a problem. 2.) The HQ is utilized, but descriptions are kept simple and vague. 3.) The HQ description is drawn from readings of back issue stories -- a somewhat hit or miss approach, as those back issue stories themselves may or may not have been ghost written episodes. 4.) The specific HQ information is either provided by or actually authored by Dent, or possibly by the magazine’s editors. 5.) The HQ description comes entirely from the imagination of the ghost writer. In this case, it is either so in keeping with the mode of the locale that it seems correct, or conversely is based on misconception of the locale, resulting in often glaring discrepencies. 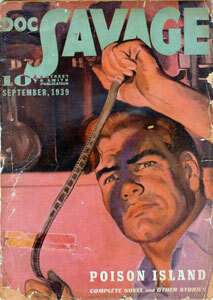 Two of Ryerson Johnson’s three novels use HQ locations. The usage in Land of Always-Night is fairly informative, including the blue electric-arc trap preventing retreat through the lab door. HQ coverage in The Motion Menace is brief but standard. Dent was likely responsible for the HQ details in both stories. Lawrence Donovan uses the HQ location in all but one of his Doc stories, though he has little familiarity with anything other than that the HQ is in the ESB (descriptions in He Could Stop the World indicate this) and that it is composed of three large rooms. He knows the layout well enough to place the elevators in their proper position in Land of Long Juju, though he erroneously locates Doc’s safe in the laboratory in this novel and also in Cold Death. For the most part, his descriptions of the HQ are cautious and not very specific or revealing. In instances where he tries to be more detailed, he creates discrepencies, such as in Haunted Ocean where he refers to “other offices” besides the library and lab. Dent of course had no hand at all in Donovan’s work, most of the information coming either from the magazine’s editors or from Donovan’s readings of back-issues. He seems to have read Land of Always-Night (from which he borrows for Murder Mirage the blue electric-arc trap in the lab), Spook Hole (he uses Doc’s fish tank exit in Land of Long Juju and a couple others), Dust of Death and perhaps others. By the time he wrote He Could Stop the World, his descriptions are more polished. He has a thing for severely smashing up Doc’s lab -- it happens several times in the Donovan stories. On the whole, though, his information on the HQ is not completely reliable. In the case of Harold Davis, a paradox exists. For a writer whose early Doc stories Dent had such a close hand in, Davis never seems to have a firm, accurate grip on the HQ layout and facilities. 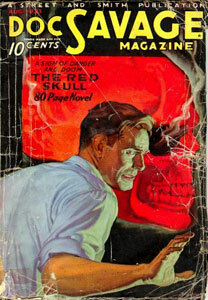 The first four novels Davis worked on (The King Maker, Dust of Death, The Seven Agate Devils, The South Pole Terror) Dent tinkered with greatly, actually redictating them in their entirety. The style and HQ description in these novels (The Seven Agate Devils doesn't use the HQ) can then be attributed to Dent and relied on as accurate. The problem arises in later Davis works. Dent didn't improve on these so much as time went on -- some of them he doesn't seem to have touched at all, as descriptive contradictions abound. Because of his lack of information on the HQ, Davis either avoids using it or else keeps his descriptions very thin. There is evidence that he drew details from back-issues, including some by both Johnson and Donovan, and he probably read The Freckled Shark from which he borrows the pneumatic mail tubes for Devils of the Deep. Like Donovan, when he volunteers more than sketchy HQ description, he creates discrepencies. 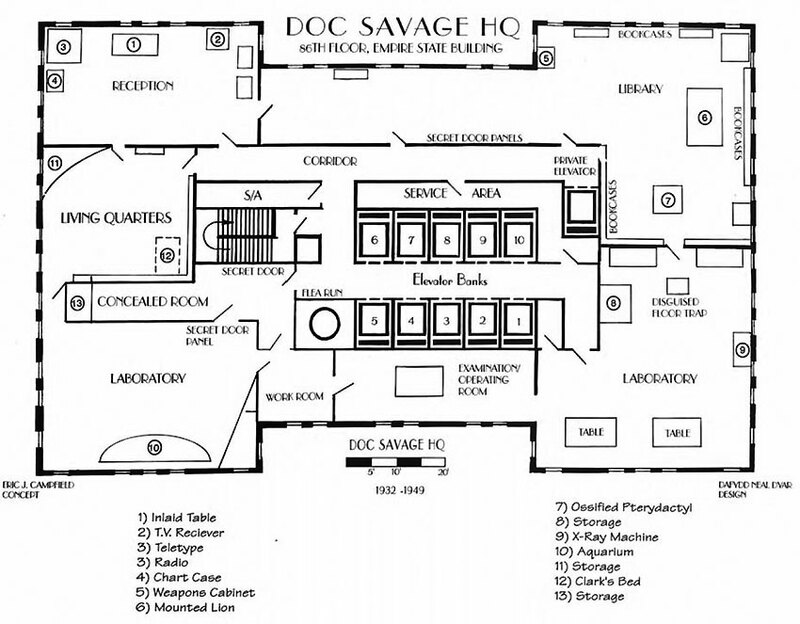 In The Green Death, he projects an image of the HQ more compartmentalized than just the three main rooms, and the same confusion turns up again in The Purple Dragon, Chapters 4, 7, and 8, which refers to an explosion “from a room far back among Doc’s suite of offices.” By the time he wrote Devils of the Deep, his last known ghosted Doc novel, the problem is still in evidence. In Chapter 6, Doc appears suddenly in the HQ “from an inner room.” The other HQ descriptions are similarly hazy, and it appears that Harold Davis never did develop a clear picture of the HQ layout. With the exception of the first four co-authored titles, the Davis novels are an unreliable source of HQ information. Alan Hathway had no help from Dent and probably only a little from his friend Harold Davis, who himself knew little about the HQ set-up. There is evidence that Hathway did read a number of back-issue stories by Dent, but apparently nothing to give him any more than scattered insights on the HQ. He avoids using it in The Devil's Playground, his first title. By the time he wrote The Mindless Monsters, he knows that after leaving the reception room door, Monk and Ham have to walk past the regular elevators to reach Doc’s private lift. In Chapter 6 he describes the lab as being “behind the reception room," and in Chapter 8, he notes that the “flea run” capable of accommodating four passengers (accurate per The Boss of Terror) is located in what he calls the “inner laboratory.” All in all, Hathway's HQ description is fairly viable though spotty and does not reflect a full understanding of the locale. William Bogart, as an assistant editor on the magazine, should have had a good background in the series, however his attention seems to have been directed elsewhere than the HQ layout. As Dent heavily edited much of his earlier Doc stories, some usable HQ material is present in these works. Overall, the problem exists in sorting out which references are Dent’s and which are Bogart’s. This is sometimes easy because of the marked difference in the degree of animation in their styles. Dent’s information, once identified is viable. Bogart’s should be ragarded more carefully. The HQ local is eliminated totally in World's Fair Goblin. Hex includes a short HQ scene in Chapter 3 which, judging from the clip of the narration, is probably Dent’s. The HQ information in The Angry Ghost is rather conservative and written in Bogart’s more essay-like style. Even the more dynamic episode in Chapter 9 in which Doc ascends to the dirigible mooring mast via a set of stairs in the lab wall is probably Bogart’s. He refers to “the roof of the skyscraper” which technically the ESB doesn't have. Dent would not likely have written it that way. The HQ segments of The Flying Goblin seem to be Dent’s and the information quite acceptable. 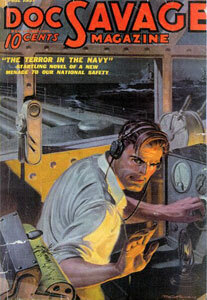 The Spotted Men and Tunnel Terror, two novels which Bogart apparently wrote on his own, do not use the HQ. Certain discrepencies (like mention of windows in the corridor) in the descriptions in The Magic Forest are probably Bogart’s, but in other places, the style is that of Dent, who may have done some quick revision on this one. 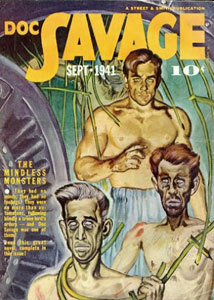 The HQ information in the later Bogart stories is very slim and standard, not very enlightening or useful. Copyright ©1979, 2007 by E. J. Campfield. All rights reserved.